Strong Families Blog: What’s Roe got to do? What’s Roe got to do? I kept my daughter, Maddie, home from preschool yesterday to see if we could kick her persistent cold. All morning I had juggled streaming Netflix with phone meetings. Now I was trying to convince her to take a nap while I began drafting a blog piece on the anniversary of Roe v. Wade, writing in my head until I could get her settled and return to my computer. I have had two abortions-- one when I was 21 and another when I was 30. Each was both clear and complex in its own way, and each brought its own complicated feelings and waves of relief. From where I’m sitting now, a happily married mother of two, I feel very grateful for Roe. It gave me a chance to stand up and say, “I choose.” I choose not to have this baby; I choose to ride the merry-go-round for longer and to see if there is a better time for me to get off. But Roe gives us something else, too. I have many friends who have gotten pregnant unexpectedly and made other choices. Some had abortions, some became young moms and/or single moms, and others placed their babies up for adoption. I have friends who have terminated pregnancies after receiving troubling results from prenatal testing, and friends who got those same results, but went forward to raise their wonderful child. None of these decisions were easy to make, but the wonder of life after Roe is that we got to make them. So as we moved into the next stage of our lives, whether we were raising a child alone, navigating a complex co-parenting arrangement, or moving forward with other aspects of our lives, it was a path we had chosen in some way. If our decision was to terminate a pregnancy, we were able to do so safely. 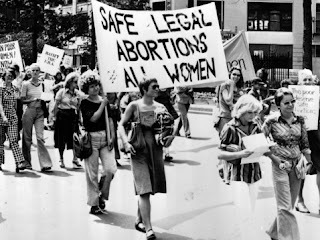 But that’s for those of us who could access abortion with relative ease, whether or not we had one. For many women, abortion isn’t a realistic option. Money, access, family pressure, or religious misgivings can make accessing abortion difficult or impossible. As a white, middle class college graduate, I could find the necessary $400. I could take a bus to the nearby clinic. I could tell my family and know that they would support my decision. Then I could get on with my life with the expectation that everything would work itself out, hopeful that there would be a time with more resources and opportunities. There is no guarantee for anyone about what the future will hold, but I am grateful for my chance to choose. When we fight for Roe, we are actually fighting for the right of women to be able to choose life for themselves and for their families-- whether it is the family they begin right now, the one they choose to wait for, or a different future they envision for themselves. In our work on reproductive justice, we remember that Roe is a beginning, not an end. A law that makes it possible for women to access abortion does not mean that we have reproductive freedom. The freedom to decide if, when, and how to have a family is the product of incalculable micro and macro steps, policies, cultural expectations, and billboard campaigns. Reproductive justice is the act of remembering that having “choice” on the books does not mean that the young men and women in our lives have a full range of good options to choose from. That battle is barely underway. When Maddie demanded that I cuddle with her instead of attending to the many things I wanted to do right then, including writing about how important it was for me to get to choose if and when to have her, I did. I let her climb up on top of me and cover us up with a blanket. She lay awake talking softly while I slept hard underneath the weight of her. This is beautifully articulated - thank you. I look ahead in hopes that we can all continue a dialogue of respecting every woman within her decision to parent, whatever her decision may be - and that we're able to continually and respectfully recognize the myriad of dynamics that contribute to making a decision regarding parenting, adoption, and abortion. Thanks for fostering that space of conversation.